July 22, 2013: One of the most shocking discoveries of the past 10 years is how much the landscape of Saturn's moon Titan resembles Earth. Like our own blue planet, the surface of Titan is dotted with lakes and seas; it has river channels, islands, mud, rain clouds and maybe even rainbows. The giant moon is undeniably wet. The "water" on Titan is not, however, H2O. With a surface temperature dipping 290 degrees F below zero, Titan is far too cold for liquid water. Instead, researchers believe the fluid that sculpts Titan is an unknown mixture of methane, ethane, and other hard-to-freeze hydrocarbons. The idea that Titan is a wet world with its own alien waters is widely accepted by planetary scientists. Nothing else can account for the observations: NASA's Cassini spacecraft has flown by Titan more than 90 times since 2004, pinging the Moon with radar and mapping its lakes and seas. ESA's Huygens probe parachuted to the surface of Titan in 2005, descending through humid clouds and actually landing in moist soil. If Titan is really so wet, he wonders, "Where are all the waves?" "We know there is wind on Titan," says Hayes. "The moon's magnificent sand dunes [prove] it." Researchers have toyed with several explanations. Perhaps the lakes are frozen. Hayes thinks that is unlikely, however, "because we see evidence of rainfall and surface temperatures well above the melting point of methane." Or maybe the lakes are covered with a tar-like substance that damps wave motion. "We can't yet rule that out," he adds. The answer might be found in the results of a study Hayes and colleagues published in the July 2013 online edition of the journal Icarus. Taking into account the gravity of Titan, the low viscosity of liquid hydrocarbons, the density of Titan's atmosphere, and other factors, they calculated how fast wind on Titan would have to blow to stir up waves: A walking-pace breeze of only 1 to 2 mph should do the trick. But now the seasons are changing. 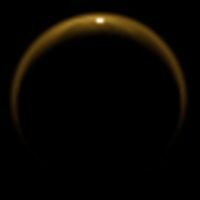 In August 2009 the sun crossed Titan’s equator heading north. 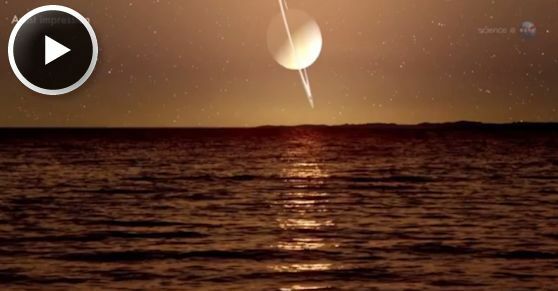 Summer is coming, bringing light, heat and wind to Titan's lake country. "According to [climate models], winds will pick up as we approach the solstice in 2017 and should be strong enough for waves," he says. Hayes is excited about "bringing oceanography to another world. All we need now," he says, "are some rough seas."